This is a very good, if straightforward, imperial stout. I would never be sad to drink this beer, especially at the holidays! L: Poured from a bottle to a pint glass. Had a dark brown / black color and a thick, opaque consistency. There was a half inch of creamy, tan-colored, fairly long-lasting head. Fantastic lacing. S: A solid aroma of coffee, malt, chocolate, molasses, and vanilla. 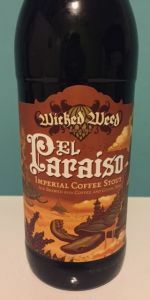 T: Tasted of a moderate amount of malt (present throughout), a decent shot of coffee (less than expected, though), a hint of vanilla, some chocolate, a little molasses, and a boozy quality. An interesting, if a little odd, favor. There's a weird kind of astringency that mutes the coffee; most likely this is caused by the booze. Nonetheless, the chocolate helps balance it out. F: A decent amount of carbonation with a super dry finish. Medium-bodied. O: An uneven beer, but somehow still likable. Worth a look. Look: dark black, medium tan head fades, retention is ok.
Aroma: Coffee and vanilla are upfront and very aromatic. Touches of coffee and brown sugar. Taste: coffee and dark chocolate are prominent up front. Hint of fig or raisin. Little bit of rum. Touch of baking soda at the end. An aggressive pour gets you about a finger’s worth of light brown foam, rippled surface, for what it starts with the retention is good, thin if broad sheets of lacing. Pure black throughout, the liquid is very clean, can’t see any bubbles. Layers and layers of milk chocolate, café au lait, butterscotch fill the nose, chicory and tar accents help stiffen it up, the raisin, cherry fruit scents all but lost in the roasty lift. Medium-bodied, not as thick as expected and the carbonation gives it a steady churn to help separate the flavors. Subtle tones of licorice, anise break up the pleasingly monotonous chocolate and coffee flavors. Stronger presence here in the plum, cherry flavors but these are still nowhere near dominant. Again, ends with a nice chicory burst. Flavorful without getting over the top. A: This poured an opaque cola with some tan head. S: It smelled like molasses and bitter dark chocolate, with some smoky espresso and vanilla bean. T: It tasted like smoky espresso and bitter dark chocolate, with some molasses and vanilla bean. It had a clean and bitter aftertaste. M: It was thick with frothy carbonation. Nice full body. D: This was a nice imperial stout with fairly basic scent and taste. Bold and well balanced, but nothing unique. The body was solid and the finish was fairly smooth with well hidden alcohol, so it was pretty easy to drink. Age would likely help improve. Fresh is good not great. Thanks for the share, Mark. This one pours a fairly dark black, with a small head, and not much lacing. There's a touch of slightly sweet green pepper on the nose, with lots of coffee otherwise, tons of cocoa, and slight roast. Luckily, the taste brings none of that green pepper from the nose. The coffee is a tad muted, but adds a nice fruitiness, almost like chocolate covered berries, with just a hint of roast. I wish this had a beefier and thick roasted malt backbone to stand up to the sweet flavors, but it's still very tasty. This is medium bodied, a tad wet/syrupy, with a normal level of carbonation. This is very solid, but the barrel-aged edition of this is definitely a big step up. A - Dark brown to pitch black pour with a frothy off white colored head. S - Cocoa, roasted chocolate, vanilla. T - Mild chocolate, some cocoa, a mild coffee cream bitterness on the back end, some charcoal, and dry on the back end. The ABV is very well hidden in this beer. M - Big medium body, silky texture. O - Coffee is very mild in this but definitely worth a try. pours a dark brown with a thin layer of bubbles. nose; coffee, milk chocolate, & light vanilla. taste; roasted dark malt, coffee, vanilla, hazelnut, creamer, & light hops. nice 'roasty & nut' aftertaste, with some definite lactose feel. medium carbonation & mouthfeel. decent, but overall, just a bit too much on the sweet & debittered (ie, porter) side for me.